TGIF Team Stryker fans! I have the day off so it’s a very special TGIF for me. I’m trying to be as lazy as possible while still getting all the little things done that I’ve been avoiding for ages. I have to get my passport renewed as well as get my vehicle registered for another year. 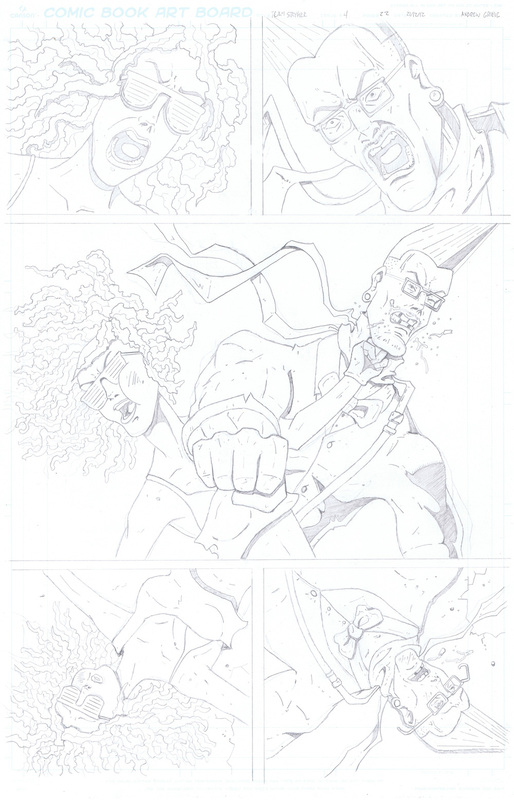 Which sounds almost as much fun as penciling page 22 of Team Stryker Mission 004! I had to do several different variations of this page to make sure that it looked just right. One concern was over having a male blatantly punch and knock out a female. I never wanted the page to be anything but lighthearted and funny and to make more fun of hipsters than men and women hitting each other. My hope is by having Piers getting his teeth knocked out it shows that he got it way worse that poor Freedom (aka Gertrude). Today is a special day as Team Stryker (and myself) received our 1,000th follower on Twitter! This is a huge milestone as each new follower means another person to enjoy in the joy that is Team Stryker. You can join in on the action on Twitter and Facebook! Have a great weekend and I’ll see you all back here on Monday!